Video Conferencing Systems Have Changed! 28 Apr Video Conferencing Systems Have Changed! You might not have got the memo but video conferencing systems have changed. The days of the old ISDN and point to point video conferencing systems are well and truly gone. These days it’s all about open platform, BYOD (Bring Your Own Device) and the en vogue term now is Unified communications (UC). In this post we’ll talk about some video conferencing systems and let you know which we think is the best of the market today! Unified communications (UC) refers to the integration of communication tools that help people exchange ideas and do their jobs more effectively. Video has become the mainstream method of collaboration for businesses of all sizes. 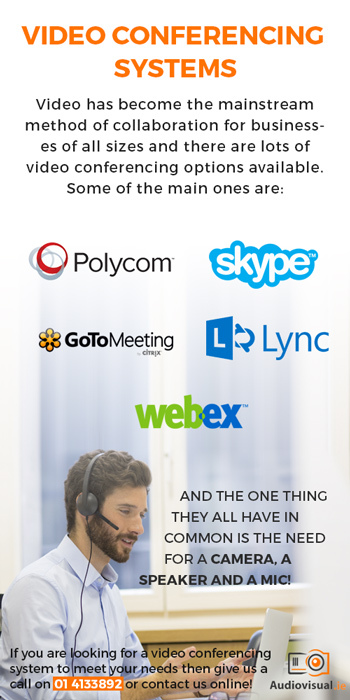 Whether you use Polycom, WebEx, Skype, GoToMeeting, Lync, or any other platform on your device, one thing is for sure – you will need a camera, a speaker, and a mic for video conferencing. We have been round the houses checking out some of the video conferencing solutions available, and our favourite is the Logitech GROUP VC System. This system is designed for small to medium size groups (up to 14 people) and frankly changes the way teams collaborate. It provides crystal-clear audio and razor-sharp video at a very affordable price. You can turn any meeting place into a video-enabled collaboration space. This system offers performance businesses can rely on. The Logitech GROUP VC is as simple as plug-and-play and has full duplex omni-directional speakerphones and a wide field of view – so everyone in the room can be easily seen and heard. I cannot overstate the simplicity involved connecting this unit. It is literally a couple of usb’s and power and you’re ready to start video conferencing. The microphone pick up is excellent and additional mics can be daisy chained. What makes this system so good is the price. At sub €1250 Ex Vat (at time of print 28.4.16) overall it offers high quality performance at a great price point. The Logitech GROUP VC units are available to rent from us here. If you’re looking to start video conferencing this is the system we recommend. All you need is your laptop, a good internet connection and the Logitech GROUP VC! Drop us a line or call us on +353 1 4133892 for further information. Apart from above video conferencing tools like R-HUB HD video conferencing servers helps businesses in reduced travel costs, better client interaction, increased productivity etc. It is an on premise solution which works on Windows, MAC, Unix, Linux, Android, iOS etc.